These fake reusable press on fingernails will add a unique touch to your elf costume or Christmas Holiday costume. They can also be worn as part of your outfit for holiday parties or caroling. 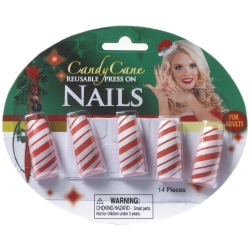 Each set of candy cane fingernails include ten reusable press-on fingernails.